Let's talk bows for a minute, and I don't mean Sunday outfit accessory, macaroni shape, or cute hair ribbons. A violin bow is the name of that wooden sword-looking thing that violinist move back and forth across their strings. Buying the best violin bow possible is important, as the quality of a bow will affect the quality of the sound you are able to produce. With that said the frugal mother in me feels it necessary to let you in on a little secret....it is not vital to spend a lot of money on smaller sized beginner bows. At the beginner level you will not be using all of the technical bow strokes that require a finer bow. Also for bow sizes smaller then 3/4 you will not even get the responsiveness or bounciness, found in full size violin bows, regardless of the materials used to make that bow. Save your money for when your little violinist grows up though, because a really nice bow can be very expensive, and will make a huge difference. The violin bow my own 7 year old daughter is playing on now is the one pictured below. The Imported Brazilwood by Schmidt is a nice solid bow for beginners, has a nice full set of hair and has worked great for her. It get's my stamp of approval for quality, and the price is really great too. I personally began playing on a fiberglass bow and used it clear up until high school when I had saved up enough money to buy a Brazilwood bow. The price range for Fiberglass bows are $20.00 to $50.00. 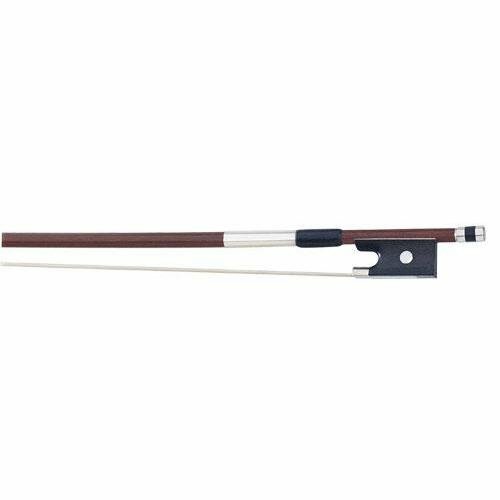 One fiberglass bow that gets excellent reviews from violin shops and customers is the Glasser Premium fiberglass violin bow . In addition to 4/4 the Glasser also comes in sizes; 1/16 , 1/10 , 1/8 , 1/4 , 1/2 , and 3/4 . These bows are known for their excellent comfort in hand and smooth sound. Although comparable to student-grade Brazil wood bows, there is one difference; The Glasser fiberglass violin bow is more durable, will not warp or break at the tip! For the beginner to intermediate player I recommend the Brazil wood bow. This is the type of bow that I used in high school and college and it was awesome. The difference between fiberglass and Brazil wood is mostly in the wood part of the name. Fiberglass is a synthetic material. Brazil wood bow is crafted from several kinds of tropical hardwoods. Some people argue that bows made out of actual wood are better, opposed to synthetic materials like fiberglass. This is part of the reason why Brazil wood bows are so popular. They are fairly affordable and durable, made from wood, and with a slightly better sound and responsiveness then fiberglass. Price Range for Brazil wood run between $50.00 to $300.00. As an intermediate student you may also find a lower-end carbon fiber bow that would cost the same as a high-end Brazilwood bow, and be the same or better in quality. 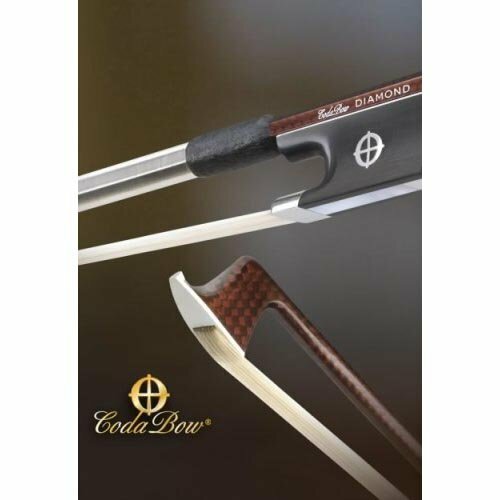 The CodaBow Prodigy carbon fiber bow is around $300.00, and is a great bow for that price. I'll discuss the advantages and strengths of the CodaBow in more detail below. Another option is the Glasser Braided Carbon Fibre . This carbon fiber bow usually runs under $300.00, but gets great reviews and positive discussion on all the violin forums I've read. The Glasser and CodaBow companies have been around a long time, and make great products, they sell some of the best violin bows on the market. When the student becomes advanced it is easier for the student to take a bow for a test drive and find the little differences in sound and feel that make the bow superb in quality. Most advanced and professional violinist use the pernambuco bow and carbon fiber bows. For many years the pernambuco has been considered by many to be the more superior type of bow, but with the advances that bow makers have made in using carbon fiber combined with it's durability, reliability, consistent weight and good balance, the carbon fiber is gaining recognition as a reliable and beautiful bow. Carbon fiber bows have proven to be more economical overall. When shopping for a bow, an advanced violinist should go to the violin shop with a rough budget in mind and then be open to all types of higher quality bows. Don't limit yourself to one type of maker, material, or shape (octagonal or round). The CodaBow is a great choice of bow and one that should be taken seriously when buying a violin bow. In an article featured in All Things Strings Science by Heather K. Scott, different carbon fiber bows were tested and discussed by professionals. Several judges complimented CodaBow's high quality of sound and equally high level of craftsmanship. Many of the reviewers had already played CodaBows, "they've been around for so long," said Eldridge. Summing up most of our judges' comments, she added: "Really nice acoustics and aesthetics and a lush sound." For serious advanced students the CodaBow Diamond GX Carbon Fiber is a great solution. They are stable, responsive, and produce sounds similar to that of some of the finest pernambuco bows but for a fraction of the cost. Plus, the DIAMOND Collection is backed by CodaBow's lifetime guarantee.